Water and oil repelling, waterborne spray with high impregnation properties, based on nanotechnology. It creates a thin, invisible shield of high strength and durability. It repels moisture without altering the look and texture of fabrics. Once applied, it facilitates water-only cleaning of fabric and prevents damage from detergent use. It waterproofs most synthetic and closely woven cotton fabrics. It also prevents the creation of stains from oil, wine, coffee, drinks etc. 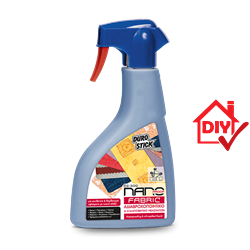 Use NANO PROOF FABRIC DS-300 to easily protect closely woven fabrics, carpets and various carpeting. The product will also protect curtains, sofas and car upholstery fabrics. Protect awning fabrics and canvas, sports shoes as well as handbags and all other items using fabric in their structure and manufacture. Depending on the absorbency of the surface.